1. Danger by association. Perhaps a better description is ‘sympathetic danger’ in that a sensitive dowser could contract an illness from a sufferer who is desperately (but subconsciously) seeking someone to share the pain. The dowser, because of his or her developed sensitivity, would naturally ‘reach out’ mentally and perhaps latch on to and provide a pathway for transfer of detrimental energies. 2. Danger from earth energies. As many of you know, I believe that a great number of these energies are ancient thought forms left in place accidentally or intentionally by our forefathers. So let me split this section. a) Genuine Earth energies. I have only found two which cause discomfort or illness, those from water lines (Refs. 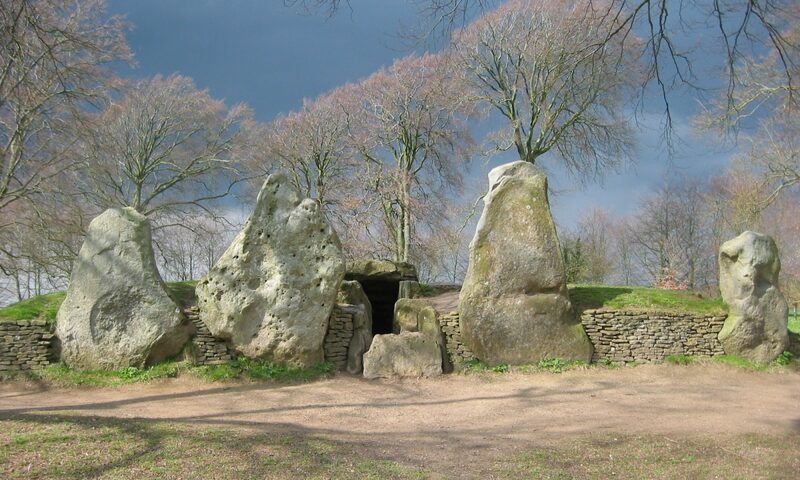 1&2) and those from certain standing stones. These latter are the result of natural radiation (microwaves, cosmic rays etc.) which are channelled and concentrated through the stone and hence energise its crystalline structure. There is a geological reason for this to occur but it is too long an explanation to cover here. In spite of many reports of other dangerous situations such as crossings of grids I have never found them detrimental either to me or others. b) Man-made earth energies consist of lines, areas and volumes of thought forms which are classified by dowsers as energy lines, energy leys, spirits of place, entities etc. There are good, bad and neutral energies of these types; the bad ones we know as black, the good ones as white or golden and the neutral ones as any colour in between or no colour at all. The danger to dowsers is very real, the more inexperienced the practitioner the greater the danger.To give an example: as a novice I began to dowse for archaeological remains in a field which had been extensively used in prehistoric times for burials and other rituals. Within a short time I had a splitting headache, my eyes wouldn’t focus and I was unable to walk in a straight line (did I hear someone say ‘hangover’?). I managed to stagger back to my car and sit with my eyes closed. Within two or three minutes I was normal again. After several weeks of basic dowsing practice elsewhere I hesitatingly returned to the field. This time there was a slight feeling of disorientation and nothing more. I often dowse in the field now without any problems, although several beginners from a dowsing class also suffered minor ill effects in this field. Many of us use protection techniques to shield ourselves in unknown dowsing situations. I have tended to shy away from any mental or physical protective acts because I found that they could interfere with or distort the results of my research. I learned to be very wary in new dowsing situations and to disregard the occasional disorientation or headaches and gradually became relatively (but not totally) immune. I seem to have reached the mental or spiritual equivalence of callouses on hands or feet! I said not totally immune: my garden is on the edge of a prehistoric burial ground and is crossed by at least 25 ‘energy lines’. Some are detrimental to health and in some small areas I can only work for a very short time before developing a bad headache. In those areas I am a very fast worker! unfocussed and can pick up detrimental energies which a more experienced dowser would ignore or defend against. 1. A Brief Dip into Water Lines. Dowsing Today Vol. 38, No. 264, June 1999. 2. A case history of health problems caused by water lines, published in Dowsing Today in June 2000.